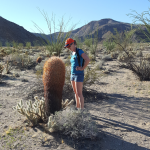 I had barely rinsed off the dirt and dust from our Thanksgiving trip to Carrizo Gorge, when we found ourselves heading back out to Anza Borrego to meet up with a couple friends for a day hike. 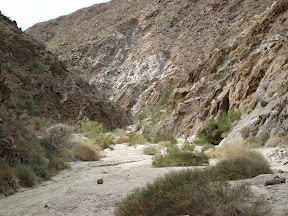 Our destination this time, was at the opposite end of the Anza Borrego Desert, a remote area called Rockhouse Valley. 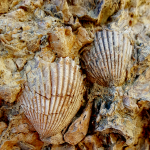 While the adjacent canyon, informally titled Rockhouse Canyon, shares its’ namesake with our favorite hiking area to the south, the two areas are worlds apart. Rockhouse Canyon “north” is a curving, narrow canyon with vertical walls on both sides which eventually opens up to the broad expanse of Rockhouse Valley. 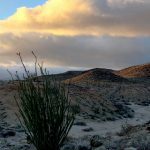 A majority of the hike is on BLM land and interestingly enough, you find yourself crossing over the San Diego County line and into Riverside County early into the hike. 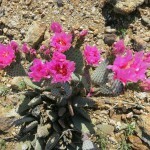 The area is also known for its’ numerous Cahuilla Indian sites, some which date back 2000 years. 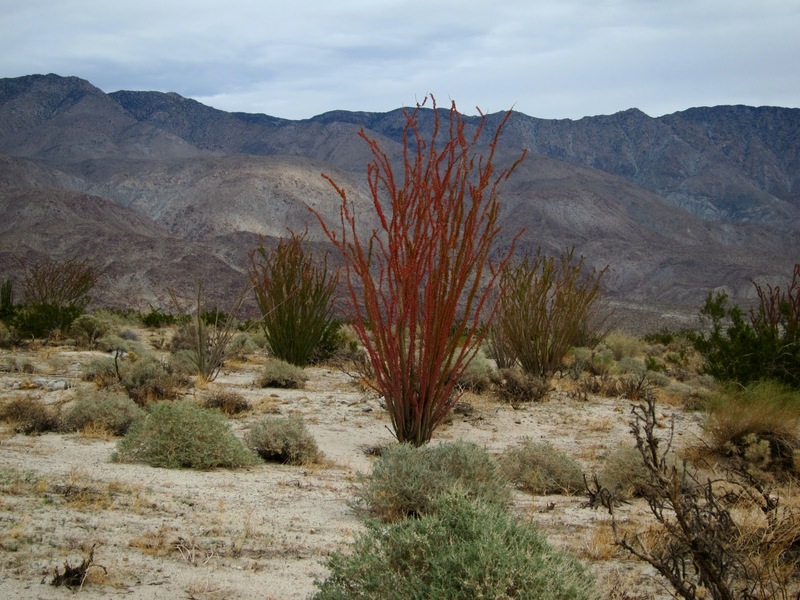 Red Ocotillo in Rockhouse Canyon. 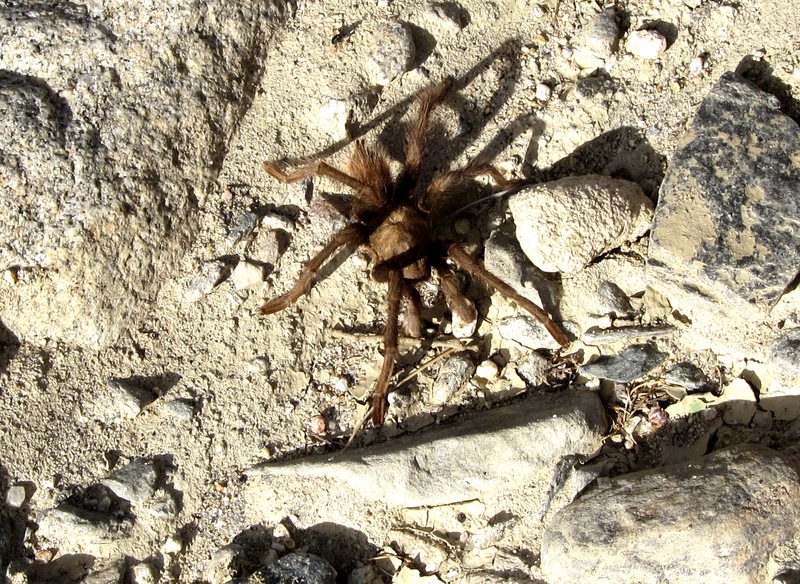 Our journey began with a crawling, bumping ride up the jeep road past Clark Dry Lake. 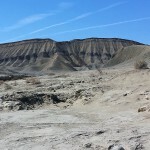 Once we passed the Butler / Rockhouse Canyon junction the trail became increasingly tough. We would hit a rough spot and John, our hiking partner, would say ” I think this is as far as I made it in my Chevy SUV. 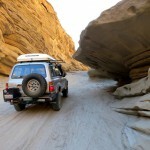 I took this as a challenge and put the Landcruiser in low range and continued up the narrow trail towards Rockhouse Canyon. I was determined to get us as far in as possible, or at least further than John was able to drive. 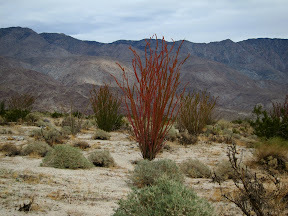 Along the trail we had noticed a few Ocotillo that seemed to have gotten into the holiday spirit and turned red. 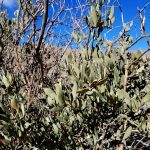 We wondered if this was a different type of Ocotillo or simply a phenomenon which we had not seen before? If anyone has any ideas please add your comments below. Once we arrived at the trail head we headed off into the canyon. 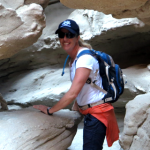 We immediately found ourselves surrounded by sheer rock walls that rose dramatically around us.The soft sand and slight uphill grade up through Rockhouse canyon made our trek a bit slow, and at one point we even had to scale up a huge dry waterfall. 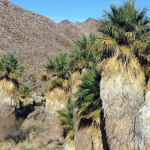 There was evidence of the recent rains all around, and we remarked to each other that we would love to witness a flash flood through this canyon. OK from high above, but still it would be an amazing spectacle. Exiting Rockhouse Canyon we entered the huge expanse of Rockhouse Valley and began scouring the area for the rock house ruins. The valley itself is amazing, with 8700′ Toro Peak towering over its’ northern edge and numerous ridges running along the valley floor. It has the feeling of a large desert amphitheater only silence not music is its’ main attraction. 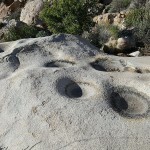 After a bit more searching we found the three rectangular rockhouse ruins. 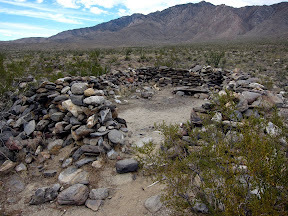 According to Diana Lindsay’s “Anza-Borrego Desert Region” Guide Book one of the houses belonged to “one of the last chiefs of the RockHouse Valley Indians”, Manuel Torte and his family. The other rockhouse was apparently built over a century ago by a prospector mining for gold in (Mojave) Rockhouse Valley. The lower rockhouses marked the end of our journey and after a few pictures we began the three mile hike back to the Land Cruiser. 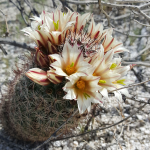 The slight downward grade, made the return trip much faster and after dropping our friends off, we were enjoying dinner in Borrego Springs. 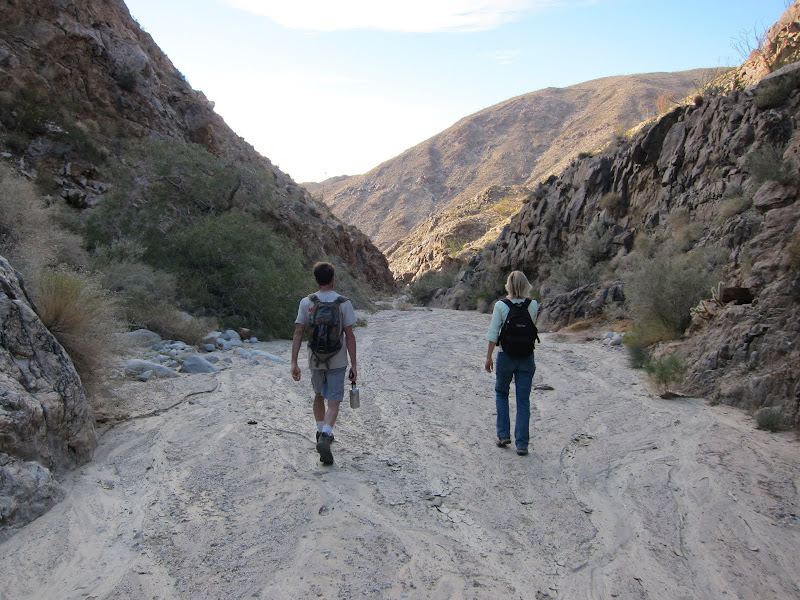 Rockhouse Valley is a great area to explore if you are interested in the history and beauty of the Anza Borrego Desert. 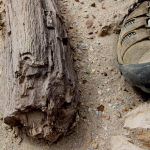 Long lost mines, Native American sites and incredible desert scenery help to remove you from today’s hectic pace and give you a glimpse of a simpler life.